This cake is available in most dim sum restaurants. 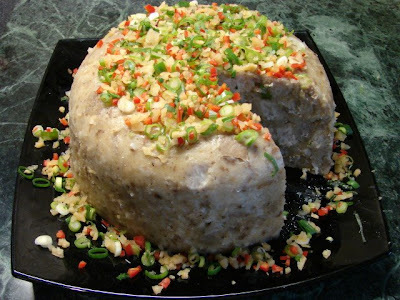 Similar to Chinese Lo Bak koh or but using Taro instead of mooli or daikon. The taro is not grated but usually cubed. a little cooking oil for greasing the dish or tin. Soak the dried shrimps with a little warm water for few minutes then chopped very fine. Cut the taro into 1 cm cubes. Heat the wok with the oil till hot then fry the taro cubes till lightly browned and dried on the outside for about few minutes. Take the taro out and leave to drain on kitchen paper. 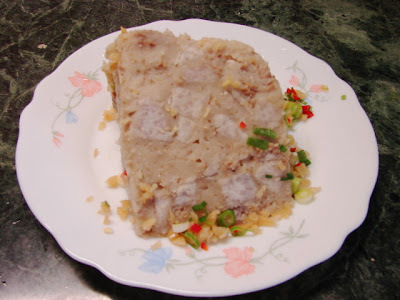 Frying the taro gives a much nicer flavour to the cake, if you really want to be lean with the recipe you can steam the taro cubes but don't overcook them or they will be mushy soft. Remove most of the oil and leave about 1 - 2 tbsp in the wok. Add in chopped garlic and shallots and fry till fragrant. Add in the minced pork and chopped dried shrimps. Stir fry till the meat is browned and no more moisture in the pan then stir in the fried or steamed taro cubes. Add chicken granules, salt, soy and ground pepper. Stir and turn off the heat, leave the mixture in the wok. Meanwhile mix tapioca flour and rice flour with cold water then pour at the same time stir in the boiling water. Mix well then pour the mixture into the wok and stir into the still warm mixture. Turn the heat on to low and stir the mixture till it begins to thicken. Heat off and pour/spread the mixture into a lightly grease pyrex or aluminium tin. Spread the mixture evenly. Steam for about 1-1/2 hour. Take it out of steamer, cover and leave to cool till warm before cutting, I normally make this at night and have it for breakfast next morning. Decorate the cake with the garnish. Slice and eat while it is warm (or ping in the microwave) or fried with some oil till nice and crunchy outside. 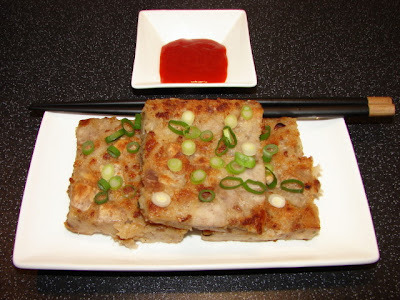 Serve with chilli sauce, soy sauce or Cantonese XO sauce also very nice with this cake. * If you don't like dried shrimps, use 1 to 1-1/2 stick of Chinese sausage (lap cheong), finely chopped. ** The cake will keep in the fridge up to a week or freeze till you want to eat again.